During recent years Fylde Bird Club Chairman Paul Slade has organised several pelagics out of Fleetwood. The trips have proved to be a hit with Fylde Bird Club members and have produced not only exceptional views of species which occur regularly off the Fylde coast (such as Common Scoter, Gannet, Manx Shearwater and Kittiwake), but also scarcer species (such as Fulmar, Arctic and Great Skuas and Yellow-legged Gull), and best of all, a Balearic Shearwater in August 2011. In 2010 Paul produced an article about the pelagics for the Fylde Bird Club Newsletter, which is displayed below. In the early to mid 1980’s Roger Scholes arranged a couple of trips out in to Morecambe Bay for Fylde Bird Club members aboard ‘The Lancastrian’ a very plush and high tech training craft owned by Fleetwood Nautical College of which Roger was the top man at the time. On the first trip on 7th May 1983 we headed from Fleetwood towards Walney and managed to see the following, 56 Common Tern, 4 Red Breasted Merganser, 15 Cormorant, a Swift, 2 Reed Buntings flying towards Fleetwood about 5 miles from shore, 70 Gannet, 3 swallows, 47 Guillemot, 2 Kittiwakes, 3 eider, 4 Razorbill, 11 Red Throated Diver, 2 Black Throated diver, 4 Razorbill, a Fulmar, 47 Sandwich Tern, a Little Tern and Wheatear and Arctic tern on Foulney. A second trip went out on the same route on 11th February 1984 between 07.45 and 15.30 even though it was dull and very foggy ! We saw very little but had a nice adult Kittiwake sat on the boat showing very well. I started my search for a boat and skipper by asking around a few friends who do sea fishing in small boats suitable for two or three people, I was told by all of them I wouldn’t have a problem finding both ! Internet search engines were my next port of call and I came up with a list of three boats that operated out of Fleetwood, firstly the ‘Wyre Princess’ sounded very grand but the phone number was dead, secondly the ‘Lancashire Lass’ sounded very local and traditional and came with two phone numbers, one of which was dead and the other a wrong number, slightly disheartened I tried the last number, Andy from the ‘Blue Mink’ bingo he was more than happy to put a couple of trips together for me. The first trip was arranged for 22nd July leaving at 17.10 for about 5 hours at sea. We were to be picked up from the beach by Fleetwood Lifeboat Station so met with eager anticipation complete with a bin of gruesome smelling chum kindly ‘fermented’ by Chris Batty at home in his garage. Quickly aboard bang on time we steamed out of the estuary and headed strongly WSW. We soon picked up a couple of Manx Shearwaters, Gannets, Guillemots and Common Scoter before we stopped about 8 miles out and deployed the chum. Very little happened for the first hour before a few Lesser Black-backed Gulls joined us which seemed to have the desired effect as a Fulmar and a few Kittiwakes joined the ‘feeding frenzy’ giving fantastic views close to the boat. There was quite a swell as we sat waiting but luckily most if not all of the crew were feeling ok.
A further trip was arranged for 18th August but unfortunately had to be cancelled due to the gusting wind conditions, a week later the rearranged trip also had to be cancelled, finally we thought try once more time. Friday 3rd September dawned perfect with a gorgeous sunny and calm day, at 2pm we again met on the beach and boarded the Blue Mink. We decided not to head as far out this time but try a little closer inshore, we were quickly rewarded with close but brief views of a couple of Harbour Porpoise. Rather than head straight out then start chumming bread was slowly thrown off the back of the boat to keep a few gulls following nearby, after about 6 miles we stopped and deployed the chum, almost immediately the gulls lost interest and landed on the sea briefly before taking off en mass and heading back towards Fleetwood, a bit of banter then took place towards Chris and the now useless looking chum before we realised what had made the gulls scarper, a shout of Bonxie went up as a stunning Great Skua flew right over the boat before alighting on the sea about 500 metres away. Many more birds were seen on this trip including about 25+ Guillemot, 20 Sandwich Tern, 12 Common Tern and 30+ Kittiwake. As we were enjoying the sunshine the skipper was on the radio to one of his fishing pal’s discussing large numbers of Scoter present recently off the end of the outflow pipe about 4 miles out off Norbreck, he asked if we would like to head that way to see if we could see any, a decision we would not regret as we neared the marker mast with flock after flock of Common Scoter all around. Switching off the engines we marvelled at the sight and sound of probably over 10,000 Common Scoter, they truly were amazing, thousand’s of calling sea duck is not something I have witnessed before. 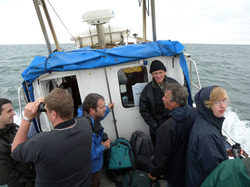 Some birds were clearly flightless as they dived to get away from this strange looking craft full of birders. Many of them must have been moulting as the surface of the flat calm sea was littered with feathers, as far as I know no-one realised Scoter were using the Fylde Coast as a late summer moulting ground. As we left the stunning Scoters we slowly headed back towards Fleetwood passing a couple of curious Grey Seals, several close Guillemot and a near summer plumaged Red-throated Diver took off to avoid the boat. All aboard agreed we had been very lucky to have such a fantastic afternoon out and looked forward to trying again next year. The following day I received an email off Barry Dyson in which he summed up the day with ‘Memories are made of days like that’ I couldn’t agree more !